Felixstowe Light Lunches: The Little Ice Cream Co.
Of a wintry Sunday afternoon, you'll sometimes find me and the kiddies splashing around Felixstowe pool -- alert, Brooms on the flume! Now, I could take or leave the swimming. Undoubted highlight for me is the post-dip trip across the road to the bustling orangeness that is The Little Ice Cream Co. Shared sundae for those ineligible to vote, large latte and a piece of warmed choccy cake for grown-ups, i.e. me. Plus they're open until 5:30pm, even in January. Unbeatable. Odd, then, to visit TLICC (see map) on a sparklingly sunny Friday lunchtime. The door's open, the sofa's inviting, and it's bright & light inside. We've got our pick of the seats 'cos there's nobody else here. Fair bet that it'd be packed if it was relocated to Hamilton Road. 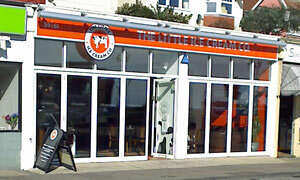 On the seafront, nobody can hear you order ice cream. Savouriness ain't really the main event here with a severely limited choice of sarnies, albeit freshly made and with a free bag of Tyrrell crisps, a la Tchibo in town. Refreshing change for a soft drinks fiend like myself to pick from a range of cans from the USofA. Root beer? Cream soda? Grape? I'll take the Mountain Dew. Given its ultra professional branding and appearance, I'd always assumed this was a franchise. Mais non, mon brave. We were told there's now a smaller sister place in Colchester but that's your lot. To finish: ice cream, naturally. Pistachio flavour. By the side of a waffle. With whipped cream. And chocolate sauce. I left feeling pleasantly nauseous. If it was a car -- Lotus Europa. If they were passing by -- Clive Owen.